Pokemon Go and its charismatic Team Leaders have lit a fire in the hearts of artists everywhere. Just look at these gorgeous works. The Pokemon Go panel at San Diego Comic Con revealed the leaders of Team Valor, Mystic and Instinct – previously rendered only as mysterious silhouettes. All the posts in this article were shared publicly on Tumblr or Twitter, and have been embedded here directly in order to retain creator comments, give full credit and direct attention back to these talented artists’ blogs. If you would like your work removed, please ping me an email and I’ll get right on it. Immediately, the Pokemon Go fandom on Tumblr embraced their glorious leaders with a fervour bordering on obsessive. Let’s take a tour through some of my favourite posts, because this is my party and I do what I want. 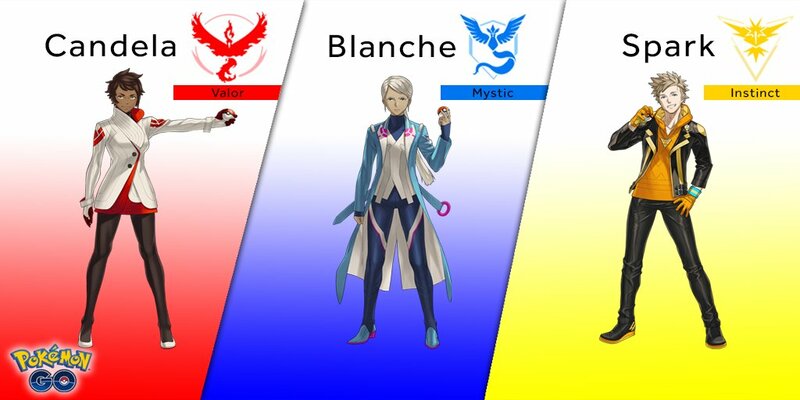 The best thing about the Pokemon Go Team Leader reveal is that the love for Candela, Blanche and Spark quelled tensions between the warring factions almost immediately. The character of the teams themselves has been rewritten for many players, as exemplified in this cartoon. The leader of the firey Team Valor, Candela’s smize seems to have been interpreted as a sign of a warm and friendly nature with a healthy competitive streak. She’s rad as heck, and seems to be the heart of the group of three Pokemon Go Team Leaders. Blanche, whose gender-neutral appearance is a welcome bit of representation, is a much cooler character. But behind their calm and focused appearance lies a socially awkward heart – according to the Pokemon Go fandom. Even before the Pokemon Go Team Leader reveal, there was a meme going around showing Team Instinct as a bit of a confused klutz – presumably because Valor and Mystic tend to dominate the scene. The official illustration of Team Instinct leader Spark is an energetic-looking fellow, and the fandom has run with an interpretation best summarised as “clueless memelord” – but a very good-looking, extremely kind, and super likeable one. There’s a heck of a lot more out there – click any of the tags in the posts above for stacks of Pokemon Go art from talented artists all over the world. Remember when you’d have to flick through the reader submitted art pages in magazines to see this sort of stuff? I love the Internet.